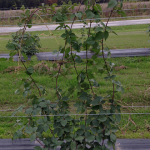 Primocane – a year 1 cane that grows from crown or root buds during spring and summer. 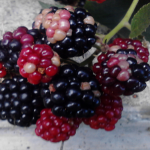 They do not produce flowers or fruit on floricane-fruiting cultivars. 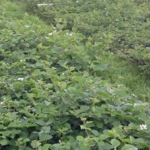 Floricane – the primocanes from year 1 become floricanes in year 2 after over-wintering. Floricanes do not grow longer in year 2. Flower shoots will grow from their lateral branches and flower and fruit in summer. 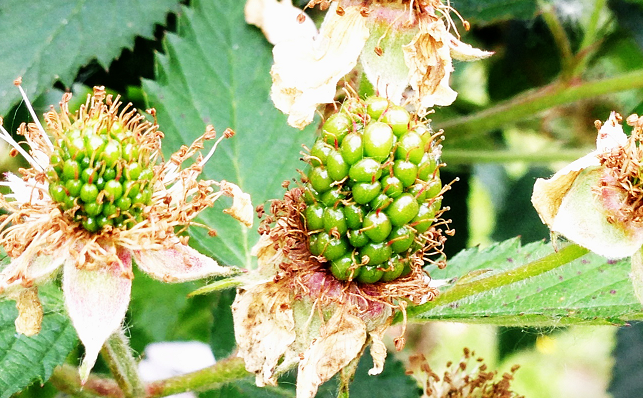 After fruiting, the floricanes slowly die in year 2. 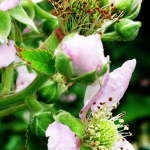 Flower shoots – These grow from buds on floricane lateral branches and will flower and fruit. Basal flower shoot – These grow from lateral buds near the ground that are on pieces of last year’s primocane. These are easily confused with primocanes. 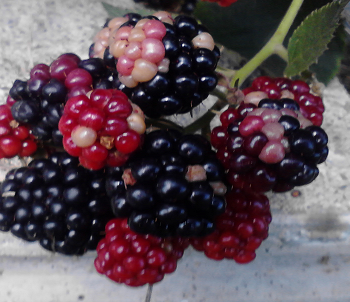 Each berry is composed of many drupes. White drupes can be caused by several factors. 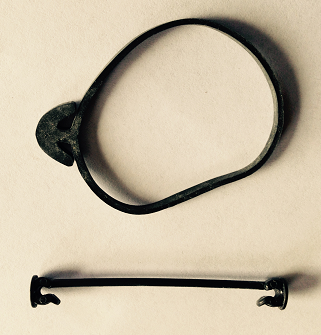 Anchor band (top) for attaching primocanes, and branchlok (bottom) for attaching lateral branches. 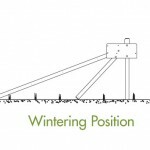 Winter position – winter cover has been removed by late February. 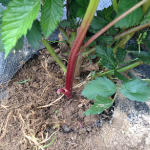 Your plants will grow very differently this year compared to following years. The tissue-culture transplants don’t have a crown but instead have a short piece of primocane buried just under the soil. This piece of primocane will get bigger each year and become the crown. The plant growth you see above the ground in the picture below is made of thin lateral branches that will be floricanes next year. 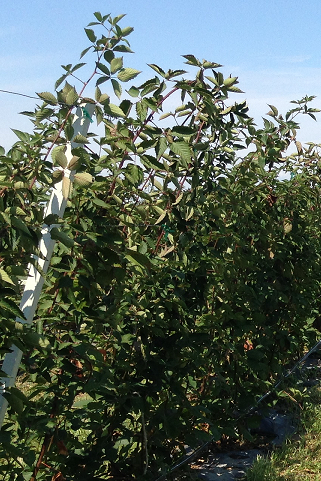 As the laterals grow, you will attach them to the long arm of the trellis using branchlocks. 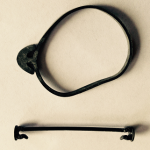 To avoid damaging the plant, do not attach laterals to the trellis wire within 6-8 inches of their growing tips. 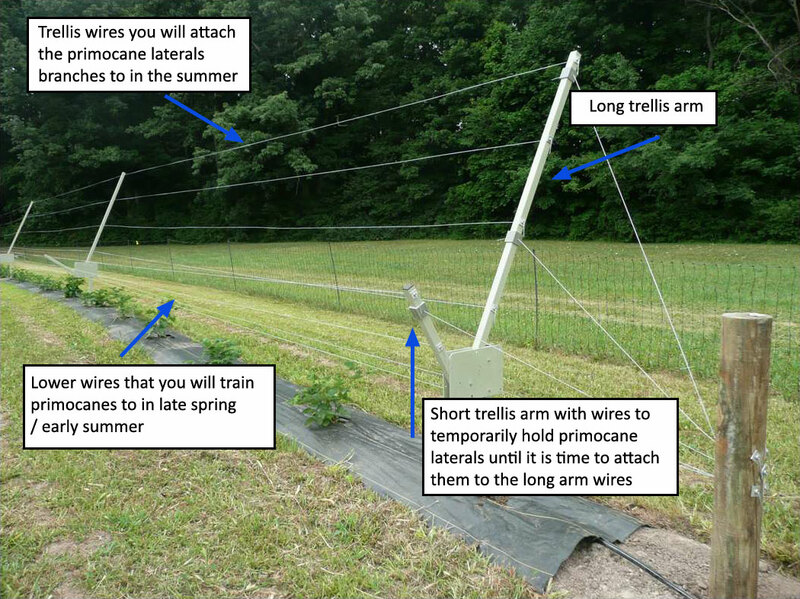 The goal is to attach about 4 laterals for every linear foot of trellis space. 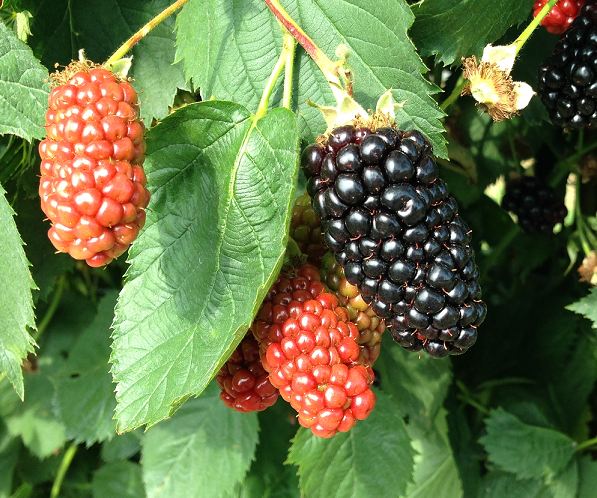 The size of the laterals at the end of the season will depend on growing conditions, the variety of blackberry, and your planting date. Some laterals will be well over 10 feet long while others may only be 3 feet long! Normally in late fall when the plants become dormant, you will trim the attached laterals a few inches above the top wire of the long arm. However, for the first 1-2 years it is a good strategy to loop some of the long laterals down to fill in empty trellis space. 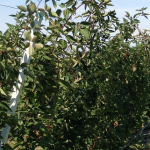 The leaves from these looped laterals will help shade fruit the next year to prevent damage from too much sun (sunscald). Once you have trimmed or looped the laterals and no longer have to mow for the season, you can rotate the trellis down for the winter. 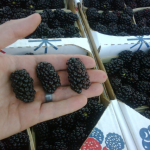 Blackberry cultivars differ in their winter hardiness so it is recommended that a winter row cover, held down by sand bags, be used in USDA Zones 6a and below. 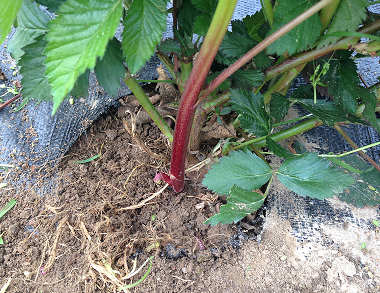 The winter row cover is also used to protect the plants in spring if there is a freeze or frost event that could damage the flower buds. Even if you live in Zone 6b and higher you may want to invest in a row cover to prevent crop loss from unexpected springtime cold damage. The winter cover is put over the plants around late November after they have hardened off enough and is removed in late February/early March. However you should vent the row covers by opening up the ends of the rows if a few days of warm (>50F), sunny weather is predicted. This will help keep the plants dormant until spring. Spring venting will allow the plants to gradually come out of dormancy. You should leave the winter cover in the field so you can quickly cover the plants before any predicted spring freeze or frost events. Soon after the plants are uncovered, the first (and most important) fungicide spray of the season is needed to keep your planting disease-free. 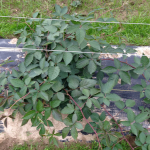 With good disease and nutrition management, a healthy blackberry planting will give great yields for at least 15 – 20 years. 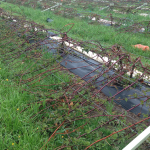 The trellis is then rotated back down and left in the “budbreak” or winter position. You may need to raise and lower the trellis a couple of times to mow the alleyways (depending on what is planted in the alleyways) until the flowers are blooming. Once in bloom, the trellis is rotated and left up for the remainder of the season. The flower shoots will stay on one side of the trellis. Placing a honeybee hive or a bumblebee quad for every 1-2 acres of planting will help with pollination – but they are not required. 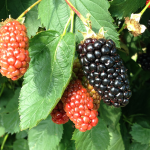 You will get a modest harvest the year after planting. Also, true primocanes will grow in summer this year. When primocanes are big enough you will start training them. 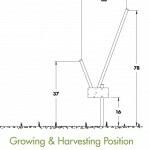 Cane training steps are described in TGS’s “2nd Year and Beyond Cane Training Standard Operating Procedure ” that is available with each RCATM trellis system purchase. 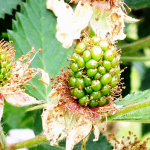 Eventually, the floricanes will be cut out to the crown when they are done fruiting. 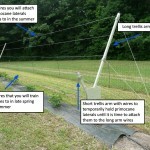 Then you will attach the primocane laterals to the trellis. This cycle will continue year after year. 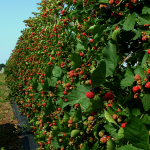 Farms that take good care of their plants and correctly train their primocanes will be rewarded with consistently high yields and quality fruit.